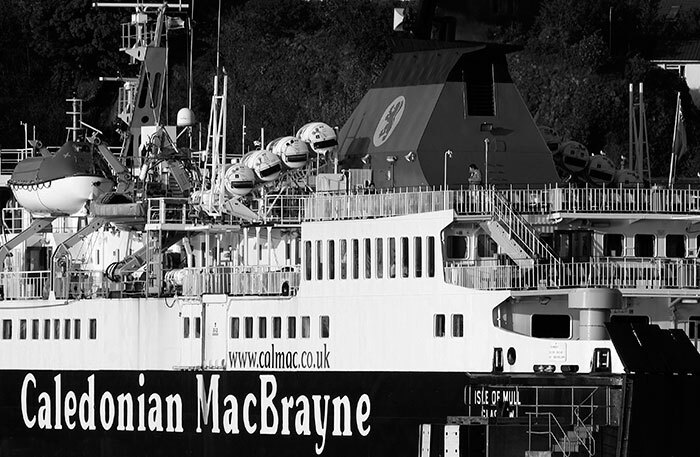 This gallery contains photographs of Caledonian MacBrayne ferries operating from Mallaig and Oban on visits in 2013, 2014 and 2015. I wanted to compose quite tightly framed images to contain the geometry, forms, shapes and patterns of their structures. Monochrome images simplified these elements and echoed the black and white paintwork on the ships but did lose the vivid red of their funnels. Calmac ferries sail from Mallaig to Armadale on Skye and the Small Isles of Eigg, Muck, Rum and Canna on seasonal timetables. I began the 2015 visit by travelling for some nine hours by train to Mallaig from northern England. At Glasgow the rounded uplands of southwest Scotland gave way to the rugged mountains, lochs, forests and grand Atlantic coast seascapes. Completed in 1901, the West Highland Railway from Fort William to Mallaig was a major engineering achievement and is rated one of the visually finest rail journeys anywhere in the world. The twenty-one arched concrete curve of the Glenfinnan Viaduct at the head of Loch Shiel is its structural masterpiece. 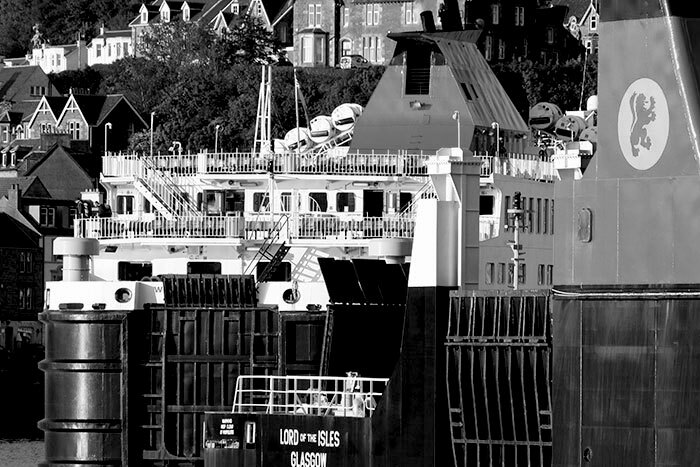 Following a tea time arrival in Mallaig I had just twenty four hours before entraining for Oban and the Barra ferry. Late evening light until after ten o’clock and an early start before breakfast next day allowed useful time for photography. 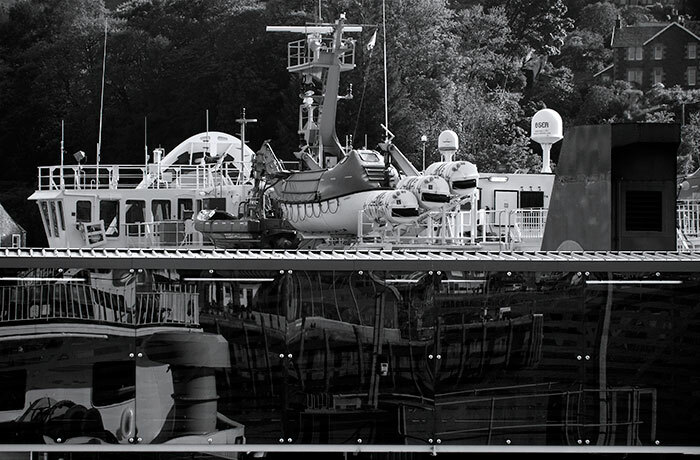 Most of the images concentrated on ships and boats in the harbour with some more to record land and sea views westwards to Skye and other islands. 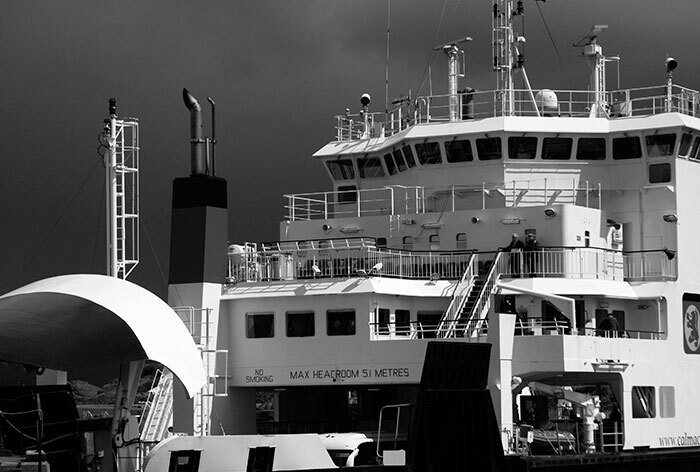 The MALLAIG BOATS AND SHIPS gallery shows a selection of those images in colour. The ferry terminal is set on the central of three piers projecting from the town centre and industrial area. 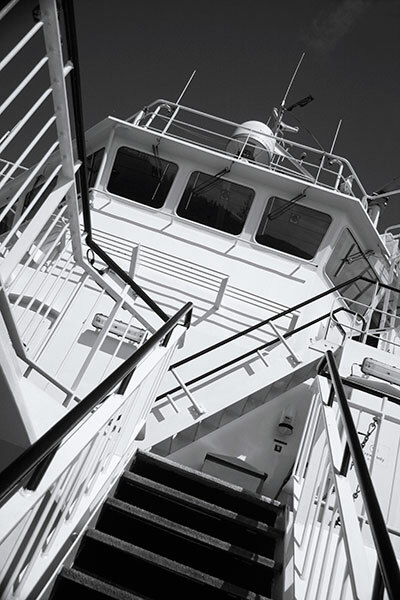 This perspective is from the landward quay through deck fixtures on one of the numerous fishing boats in the central harbour area. The oversea weather coming from the west brought dark clouds, blustery winds and short, sharp, showers. Brighter overland light to the east created strong contrasts across the ferry’s white superstructure and dark shadows amongst the smaller boats. I liked this structurally layered stern view capped by sliver of sky: vehicle and passenger boarding had not begun. 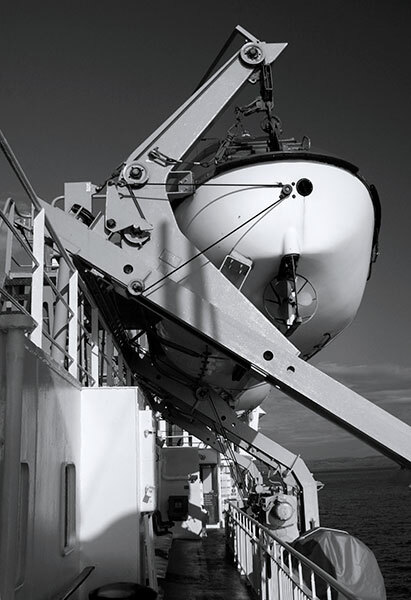 The dark westward skies and changeable weather conditions contributed much to the first four images. In the next image it was the strong geometric shape of the dark and intense blue of a clear sky set against the angularities of the white bridge structure that appealed. In 2014 I followed the same train schedule to Mallaig to immediately board the Skye ferry a short walk from the railway station. 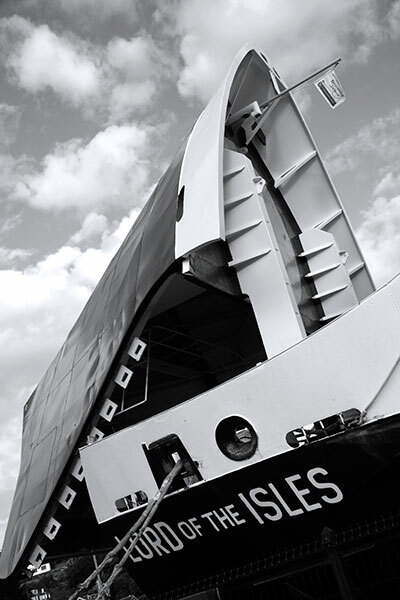 With vehicle ramps and exhaust stacks at bow and stern enclosing a central control bridge there can be visual uncertainty as to the ship’s likely direction of travel. This image was made as I moved down from the upper deck to disembark forward at Armadale in early evening light. The deliberate camera tilt was intended to emphasise the linear angularity of the ladders, railings and bridge structure. The crossing to Armadale is relatively short and even though the ferry is small it was interesting to watch it coming and going from wherever I was around the harbour. I look forward to a future crossing to stay on Skye before leaving from Uig on the ferry to Tarbert on the Isle of Harris. A longer alternative would be the Oban to Barra ferry, bus north through the length the Isles of Uist, Harris and Lewis to Stornoway and a return sailing to mainland Ullapool. This two-mast schooner was built as a fishing boat in 1903 and converted to passenger carrying a century later. 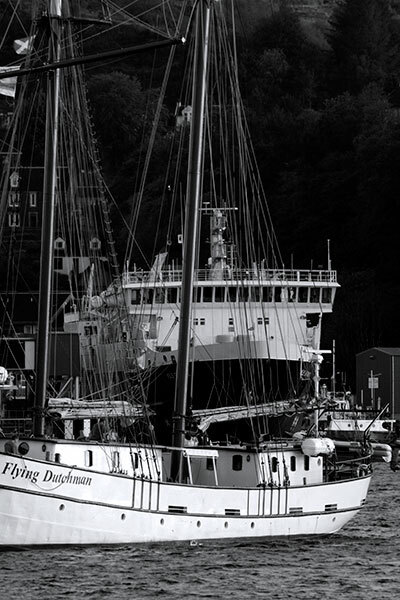 Renamed Flying Dutchman it offers well-equipped accommodation for up to 28 passengers seeking working experience on a tall ship. It sailed into Oban backed by a very low evening sun to be followed soon after by the MV Isle of Mull which moored against the shadows beyond. The sailing ship’s bowsprit is set outside the frame to exclude an intrusive quayside building. 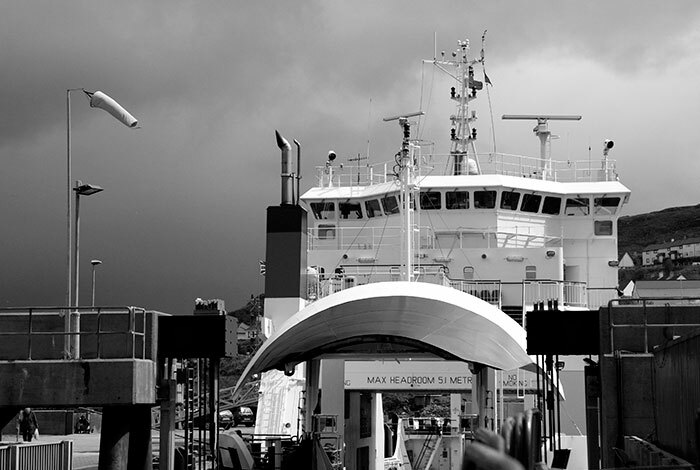 I’d intended to make a day-return ferry sailing to Barra, a small island at the southern end of the Outer Hebrides archipelago. However, the captain decided that deteriorating Atlantic weather might force an overnight stay, so preventing my departure for Mallaig the next day. Instead, I boarded a Mull sailing to Craignure and a coach trip to Tobermory. As my late afternoon return ferry was docking I recorded this combination of reflections and the superstructure of the Lord of the Isles moored beyond. 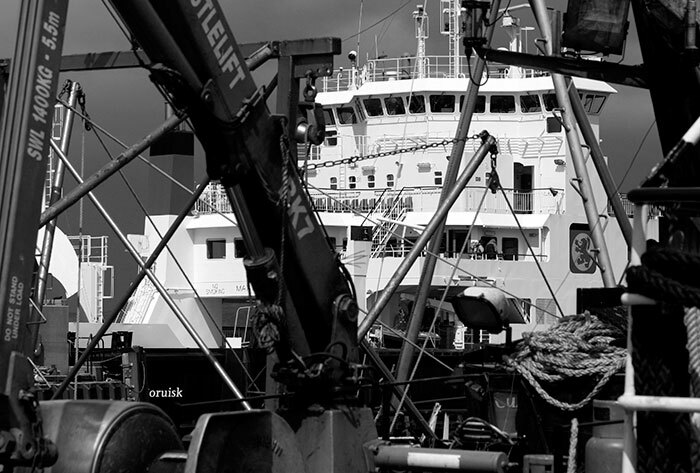 Shortly after making Image 09 I was off the ship and walking the rapidly clearing quayside. 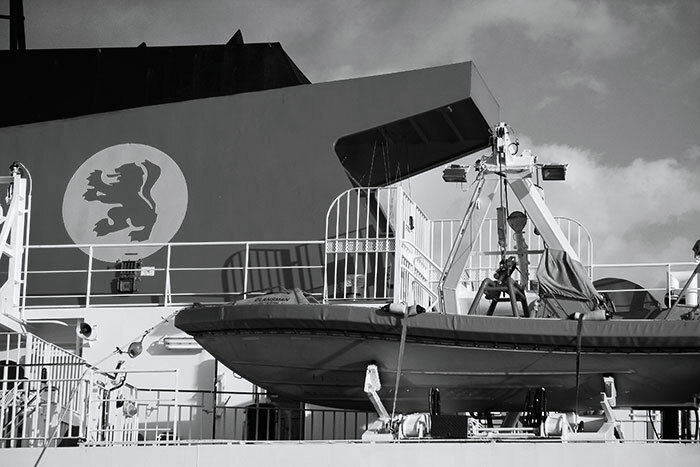 The vehicle loading bow door was open as the Lord of the Isles was prepared for the next departure. Driving on and off a vessel this size in an appropriate dock is straightforward. 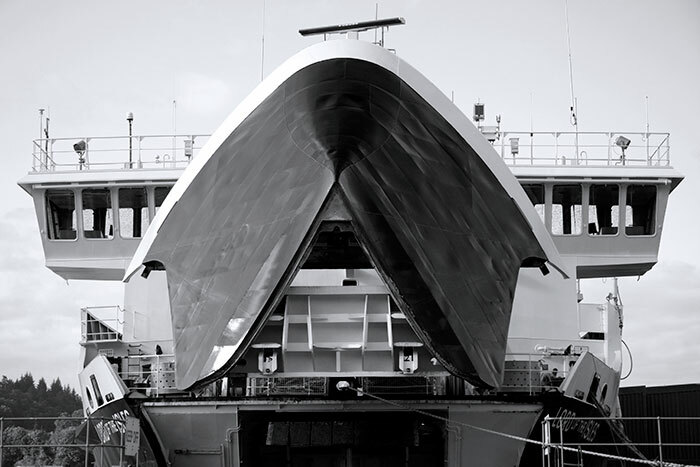 Some small ferries simply ground and lower the flat bow on to an open concrete beach ramp where rough sea conditions can make the task more interesting. Next morning the bow doors stood open ready to load road vehicles. There was some appeal in the strong geometrics of structural forms, repetition of detail and the bold lettering, all set in contrast against broken cloud in a bright sky. 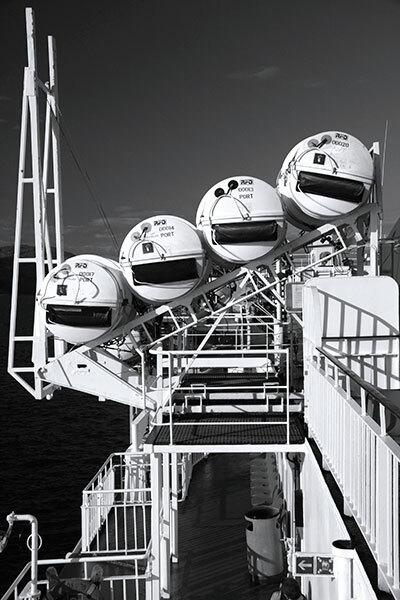 The evening sun on a sailing from Craignure to Oban created good contrast for this shot of inflatable life rafts in their port side storage cylinders. 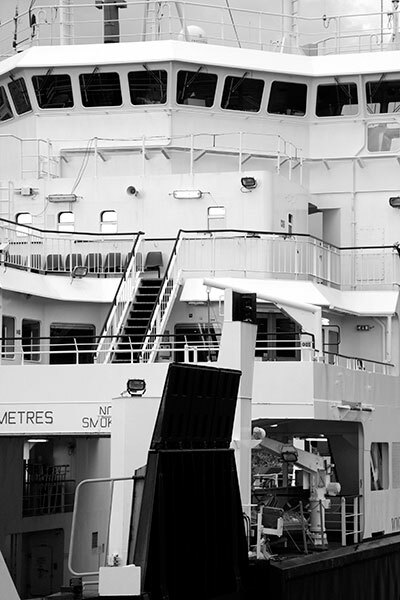 The open air passenger decks set at the stern offer both shelter and clear viewing across wide seas to Mull, Ardnamurchan and the mainland. 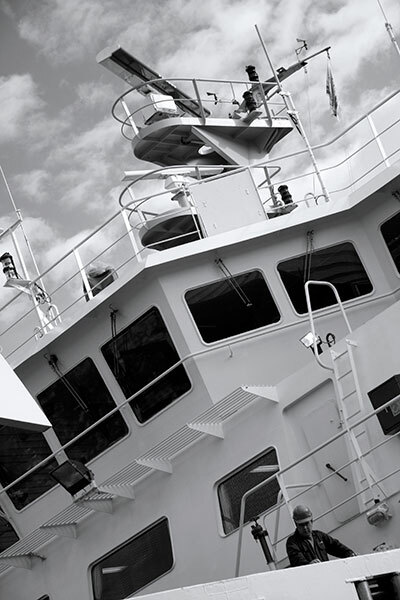 Public spaces below deck include comfortable lounges, a restaurant and sheltered sea views. 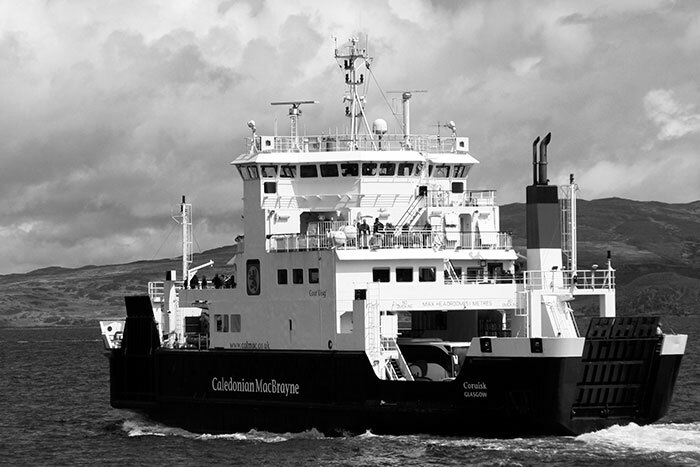 In addition to Mull, ferries link Oban to the islands of Barra, South Uist, Colonsay, Coll and Tiree, with Lismore as the shortest link: voyage times range from one to six hours on seasonal timetables. 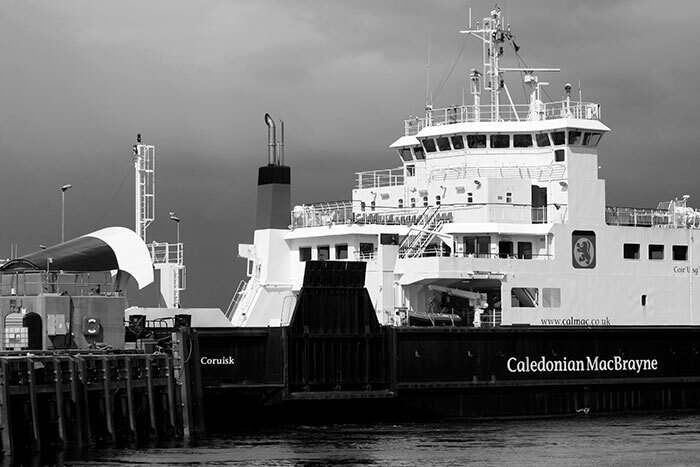 Caledonian Macbrayne ships sail some twenty six west coast routes from Ardrossan in the south to Ullapool in the far north. Oban town is built on the curving face of high ground to the east of an extensive natural harbour. On this early morning walk the ship was illuminated by sunlight reflected from clouds in a bright sky as the quay lay in shadow. 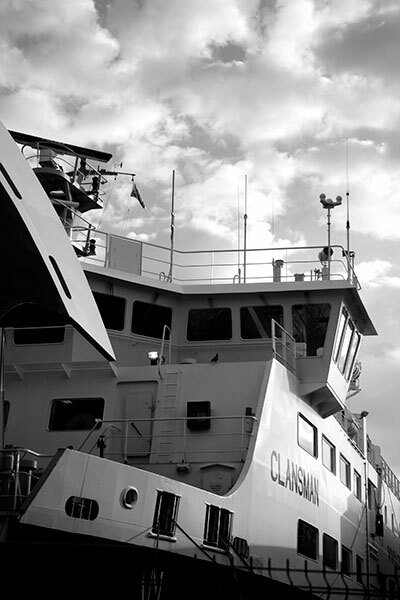 I was to be a passenger on the Clansman on this day’s sailing to the Isle of Barra set at the southern end of the Outer Hebrides. The weather forecast for the Western Isles was not good and likely to worsen. The Captain told day trip passengers that we might be stranded overnight on the island and best not sail. Even in early summer, sea conditions in the eastern Atlantic can rapidly deteriorate. Reluctantly agreeing, I boarded the Mull ferry instead. I had better luck in 2015 when a Clansman voyage to Barra was again threatened by declining weather conditions. Its usual course was reset to take shelter behind the Small Isles of Muck, Eigg, Rum and Canna before striking out south-west directly into gusting winds, heavy rain showers and rough seas. Castlebay was achieved after some seven hours instead of five. A few days later I flew out to Glasgow from the vast sands of Traigh Mhor used as runways by perhaps the world’s only scheduled air service from a tidal beach. As in 2015, my 2014 visit to northwest Scotland was accomplished on train, ship and bus: Oban was a focus for several days. This and the following image were made one evening as the MV Isle of Mull docked after its final sailing of the day from Craignure on Mull. The MV Lord of the Isles was already alongside: the evening sun intensified the contrasts of lights and darks in the ships and the townscape beyond. This is one from several shots made as the Isle of Mull moved slowly into its final docking position. I liked the warm evening light flooding the ships and the hillside houses overlooking the harbour. The following day involved travel by coach to Fort William to board a train to Mallaig from where the Skye ferry and a second road trip took me to the mainland Kyle of Lochalsh and trains south.